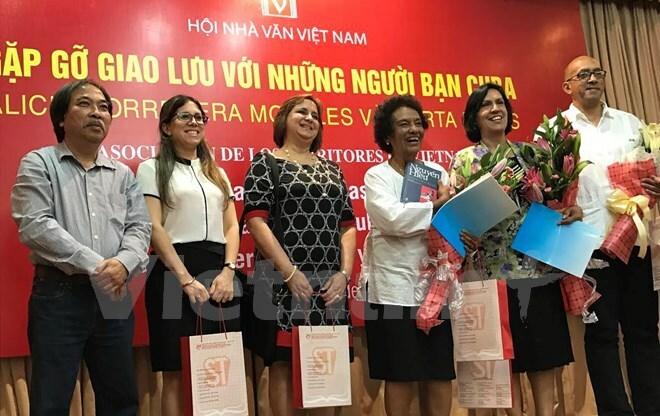 Hanoi (VNA) – Vietnamese and Cuban writers met at an exchange held in Hanoi on April 17 on the occasion of a visit by a delegation of the Cuban Institute for Friendship with the Peoples. Vice President of the Vietnamese Writers’ Association Nguyen Quang Thieu said that the visit by Cuban friends was a chance for Vietnamese and Cuban writers to meet and share experience. It also offered an opportunity for Vietnamese writers to understand more about Cuba’s literature during the renewal process and express solidarity with the Cuban nation, people and literature. At the event, Cuban writer and journalist Marta Rojas Rodrigues, author of the famous book titled “the south of Vietnam: strategic weapon is people”, talked about her book and the path that brought her to journalism, literature and Vietnam. She affirmed that exchanges and meetings will tighten solidarity between the two countries’ writers and help them create more works about each other’s culture and people.